Our mission is to be the best Peterborough area heating, cooling, and plumbing company, as evidenced by the satisfaction of past clients and the referrals they provide. Since 1997 our professional HVAC technicians and plumbers have been providing top quality installations of central air conditioning units, new furnaces, and plumbing. 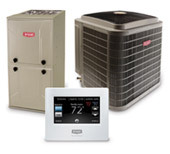 We also do trouble-shooting and repairs on HVAC systems and for your plumbing needs and we have partnered with top industry brands like Bryant and Payne to ensure the products we carry are of the highest quality; all work is backed by our 100% guarantee and we provide free written estimates on all new installations. Mike Boyle is a 4th generation heating and cooling professional and plumbing expert who learned the trade from his grandfather, one of the best at furnace and central air conditioning installation and repair. Besides honing his craft with the help of his grandfather, perhaps the best lesson Mike learned was to approach each job with integrity, offering fair prices for fully guaranteed work, and only offering solutions for necessary work. If a unit can be repaired and continue to serve its purpose and that makes sense for the homeowner, you can trust the team at Boyle Heating, Cooling, and Plumbing to tell you that. This reputation for fairness and honesty in the trade has helped him grow the company over the past number years, and these are traits he has passed down to his team of fully licensed technicians. Read more about Mike Boyle.